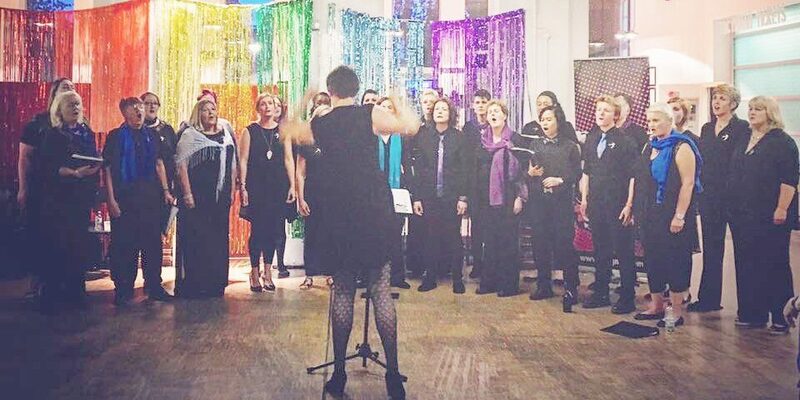 We are Songbirds, a community choir for LGBT+ women and non-binary people based in Cardiff. We were set up in 2012 and currently have around 35 members, but we always welcome new members! We rehearse every Monday from 7:30pm at City United Reformed Church. We pride ourselves on our inclusivity and we aim to be a supportive and friendly group where members can have fun and make a beautiful sound. We rehearse once a week in Cardiff and perform all over the local area when we can, often for local charities, representing the LGBT+ community and, importantly, enjoying ourselves in the process. Follow us on Facebook, Twitter and Instagram. The ethos of the choir is acceptance and fun; we are a community and a family, and we place more importance on inclusivity than being note-perfect (although, thanks to our Musical Director Rosie, we do make a beautiful sound)! If you want to know exactly what to expect if you decide to join, visit our New Members page. We put on our own concerts once or twice a year, usually in the summer and at Christmas, and often perform at Pride Cymru and the Big Queer Picnic. We’ve sung at events held by Stonewall, Cardiff University and Ty Hafan, as well as weddings, carol services and joint events with our friends South Wales Gay Men’s Chorus and Cardiff Trans Singers. The three groups are hosting the Hand in Hand Festival in Cardiff in August 2019. We are always delighted to welcome new members to our choir. Please contact us using the form provided or check out our Facebook page if you would like to become a member, arrange for us to appear at your event, or for any further information. We have a current vacancy for a Musical Director. Please click Here for more information.